In April of this year, members of Historians Against the War ratified a new policy statement addressing the perilous times we inhabit since Donald Trump’s election. It integrates our already ongoing work against the dangers of war abroad with the increased threats to democracy at home. From now on, we will be defending civil liberties, countering “alternative facts” and triumphalist narratives, and challenging militarism in its various forms. 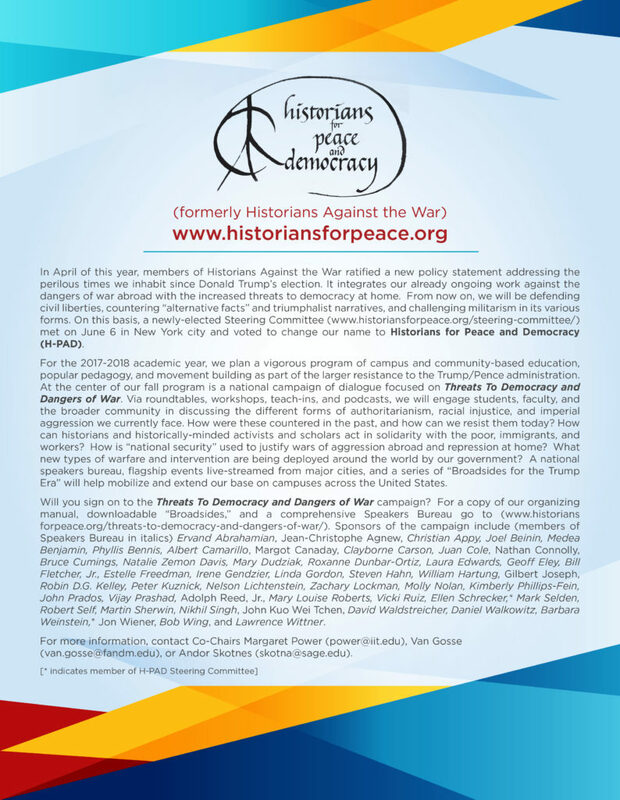 On this basis, a newly-elected Steering Committee (www.historiansforpeace.org/steering-committee/) met on June 6 in New York city and voted to change our name to Historians for Peace and Democracy (H-PAD). For the 2017-2018 academic year, we plan a vigorous program of campus and community-based education, popular pedagogy, and movement building as part of the larger resistance to the Trump/Pence administration. At the center of our fall program is a national campaign of dialogue focused on Threats To Democracy and Dangers of War. Via roundtables, workshops, teach-ins, and podcasts, we will engage students, faculty, and the broader community in discussing the different forms of authoritarianism, racial injustice, and imperial aggression we currently face. How were these countered in the past, and how can we resist them today? How can historians and historically-minded activists and scholars act in solidarity with the poor, immigrants, and workers? How is “national security” used to justify wars of aggression abroad and repression at home? What new types of warfare and intervention are being deployed around the world by our government? A national speakers bureau, flagship events live-streamed from major cities, and a series of “Broadsides for the Trump Era” will help mobilize and extend our base on campuses across the United States. Will you sign on to the Threats To Democracy and Dangers of War campaign? For a copy of our organizing manual, downloadable “Broadsides,” and a comprehensive Speakers Bureau go to (www.historians forpeace.org/threats-to-democracy-and-dangers-of-war/). Sponsors of the campaign include (members of Speakers Bureau in italics) Ervand Abrahamian, Jean-Christophe Agnew, Christian Appy, Joel Beinin, Medea Benjamin, Phyllis Bennis, Albert Camarillo, Margot Canaday, Clayborne Carson, Juan Cole, Nathan Connolly, Bruce Cumings, Natalie Zemon Davis, Mary Dudziak, Roxanne Dunbar-Ortiz, Laura Edwards, Geoff Eley, Bill Fletcher, Jr., Estelle Freedman, Irene Gendzier, Linda Gordon, Steven Hahn, William Hartung, Gilbert Joseph, Robin D.G. Kelley, Peter Kuznick, Nelson Lichtenstein, Zachary Lockman, Molly Nolan, Kimberly Phillips-Fein, John Prados, Vijay Prashad, Adolph Reed, Jr., Mary Louise Roberts, Vicki Ruiz, Ellen Schrecker,* Mark Selden, Robert Self, Martin Sherwin, Nikhil Singh, John Kuo Wei Tchen, David Waldstreicher, Daniel Walkowitz, Barbara Weinstein,* Jon Wiener, Bob Wing, and Lawrence Wittner. (van.gosse@fandm.edu), or Andor Skotnes (skotna@sage.edu).